Today we got. 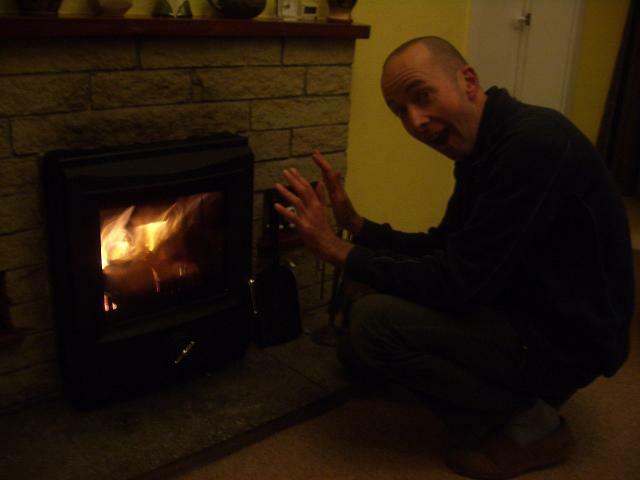 . .
We had a wood burning stove fitted in the cottage today, Paul has been getting very excited about the arrival of this little thing. As the hearth in the room is only quite small and we didn’t have room to make it any deeper we couldn’t have a free standing stove which was a shame but they do make these ones that fit into the existing fire place. Needless to say it is lit now and we are very toasty and warm, the quilt that usually lives on the settee might not be necessary to keep my knees warm tonight while I’m doing my knitting. Oh what a picture that paints. 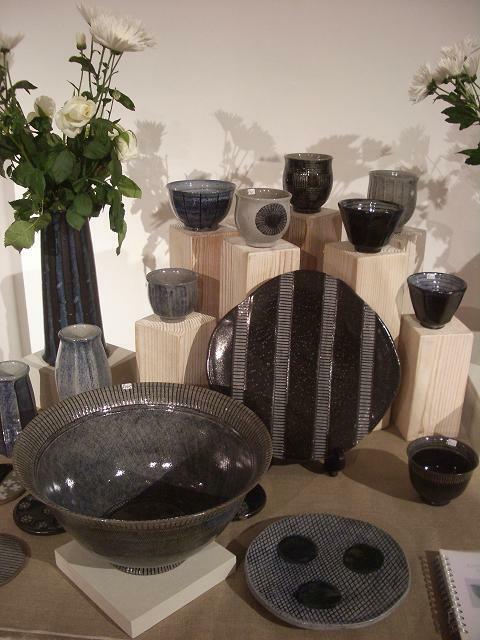 A couple more images from Ceramics in the City for you, the one above is Karen Bunting’s work, Karen works with the Geffrye to organise the show. 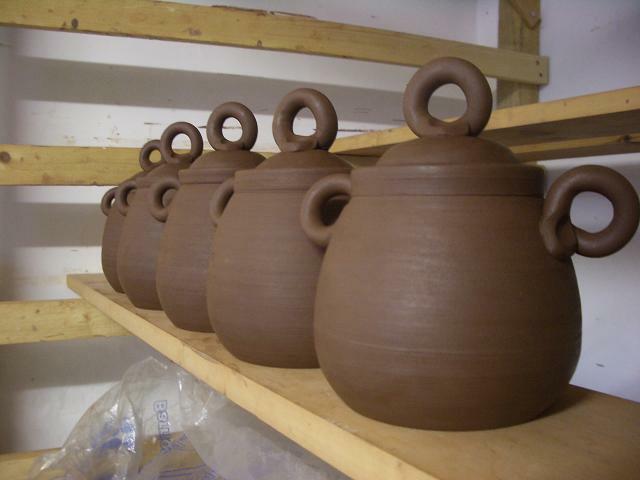 Very fine decoration on Karen’s pots, another with a huge amount of patience, they are I think very refined and calm pots and the way Karen set out her stand really suited the work I thought. This picture was sent to me yesterday by a gentleman called Maurice who had visited the show and chatted to me. A row of little jars which all got their handles today, I managed to get handles on all the jugs that I had thrown yesterday, but the mugs will have to wait until tomorrow, though they could really do with being decorated tomorrow as well. Hopefully I’ll be able to unpack my bisque firing tomorrow and get that all glazed and hopefully back in the kiln again, but there are a lot of pots waiting to be decorated too. lots of jam, personally I’d go with strawberry or raspberry but then there’s the choice of is it fair trade or organic or both or would buying Scottish jam (in my case not yours Al) be better than buying fair trade if it’s had to be flown half way around the world to get here? So much to consider, although I’m not always well off enough to be able to chose to that extent, however on this occasion the fair trade organic jam was on special offer so that solved numerous quandaries. double cream, lightly whipped – and yes Amanda there was rather a lot it was a big pot and it seemed a shame to waste it. Oven 180 degrees C, grease 2 6″ cake tins, beat butter and sugar, beat in eggs one at a time, fold in flour, split mixture into the two tins and bake till, well till done. Allow to cool, spread jam on one cake, add cream, stick second cake on top of first and sift icing sugar on top. Make big pot of tea, sit down and eat. PS Just in case, I take no responsibility for dodgy results from this recipe, I’m not exactly renowned for my culinary abilities! 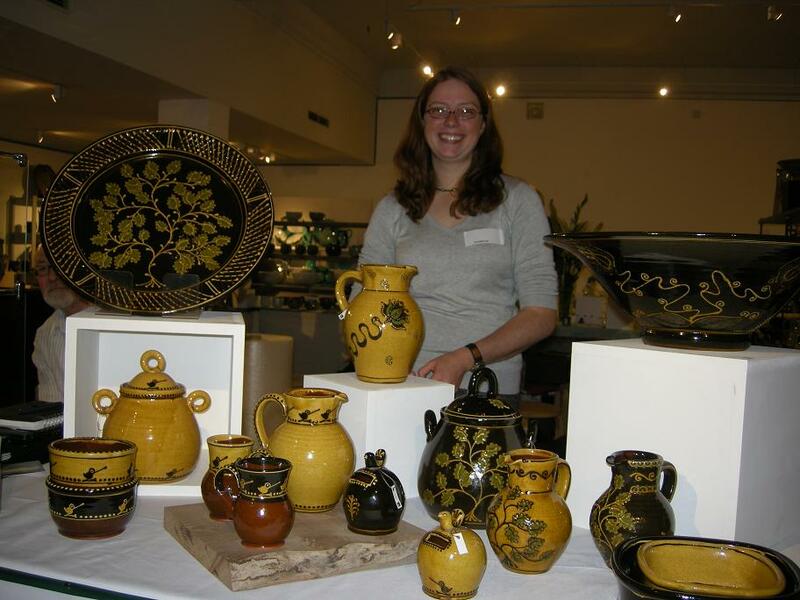 This entry was posted in Ceramics in the City, lidded jars, Victoria sponge. Bookmark the permalink. 7 Responses to Today we got. . .
Wood stove…good excuse to go ahead and get that chainsaw!!! Ooh, very nice & just in time for the chill! I can't remember, was there anything there before? Thank you so much! OMG I can not wait to try this! I tried Elaine’s pineapple upside down cake and it was awesome.So, 8oz…is that liquid or weight? Unfamiliar with those Brit measures. We do things by the cup here. 8oz being a cup (liquid measure).I’ll shoot for the fair trade jam or at least organic. There is a great store near here I shop for food and it specializes in just this type of ingredients. I’ll check on Scottish jam but I don’t think I’ve seen that.Great news on the stove! I have one I’d have given you. We never use it since it never really gets cold here.My daughter is planning a 6 week trip to Europe next summer that includes Scotland and England. I’ll make sure you are on her list if she gets anywhere near you! She can bring back my pot(s) in her suitcase and save me postage. More as that nears us. Hannah, I love the squiggly trail line with the curly q’s on the large bowl. Very whimsical. OK, Big Al, oz of the wieght variety, else it would be 225g each. Yes send your daughter this way, beautiful part of the world we have here.Graeme, we had the open fire before, the stove just fits in the fireplace.Deborah, thank you very much.